This floor scrubbing machine package features one of our hottest selling 175 RPM 17 inch floor polishers/buffers, the CleanFreak® 17 inch commercial floor buffer. It is a great buffer that can be used for any type of maintenance, including carpet bonneting, and floor buffing, scrubbing & stripping! 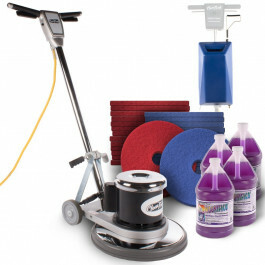 The package that is displayed here comes with all the supplies you'll need to start scrubbing any type of smooth flooring. The floor buffer comes with a 17" pad driver, and the package also includes 2 cases of a lavender scented floor cleaner, a solution tank, a case of 17" blue scrubbing pads, and a case of 17" red buffing/scrubbing pads. To sweeten the pot on this package, we throw in both cases of pads for FREE! The floor machine comes with 5 year warranty on the motor, shroud and frame and 1 year on parts. It is a great machine for commercial scrubbing, stripping, or buffing a tiled floor with a wax finish. Our most popular seller for schools, convenience stores, and healthcare facilities. It can also be used to scrub heavily soiled floors with a floor cleaning degreaser, and a more aggressive pad. If this not exactly what you're looking for in a floor cleaning package, please feel free check out our other floor buffer package deals.